Shopper Gary Broom scooped a £1,000 prize after browsing CCR Mitsubishi’s pop-up shop at his local Tesco supermarket. The Swindon franchise ran a competition to win Love2shop vouchers during the recent promotional visit to the store on Ocotal Way, Swindon. And its succeeded in luring the 52-year-old into its facility on Paddington Drive when the prize-winner dropped in to collect his prize and take a second look at its range of vehicles. 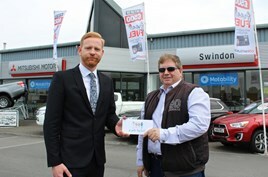 Andy Jackman, regional general manager of Swindon Mitsubishi, said: “Gary was one of hundreds of people who entered the competition across the eight CCR Mitsubishi dealerships, so we’re delighted to see someone from Swindon win. CCR Mitsubishi is the UK’s largest independent Mitsubishi dealer group with eight dealerships across the south.